"Bile Bears" in Vietnam - Welttierschutzgesellschaft e.V. 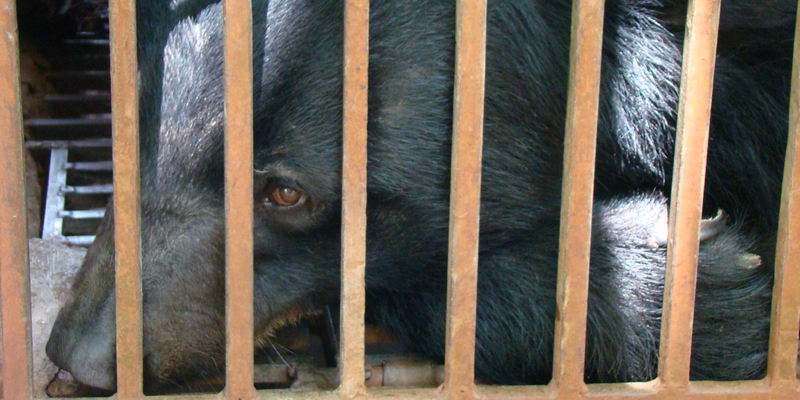 The bear bile trade has been officially banned in Vietnam since 2005. 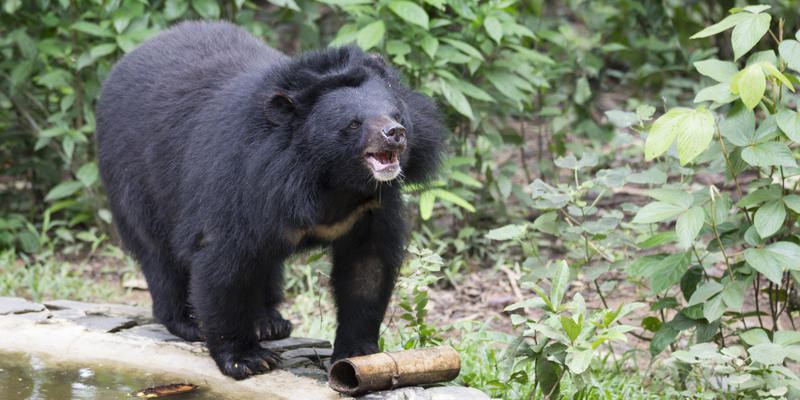 However, due to a lack of animal-friendly facilities, the Asian black bears and Sun bears remain on the farms - where they are still used for illegal extraction of bile. 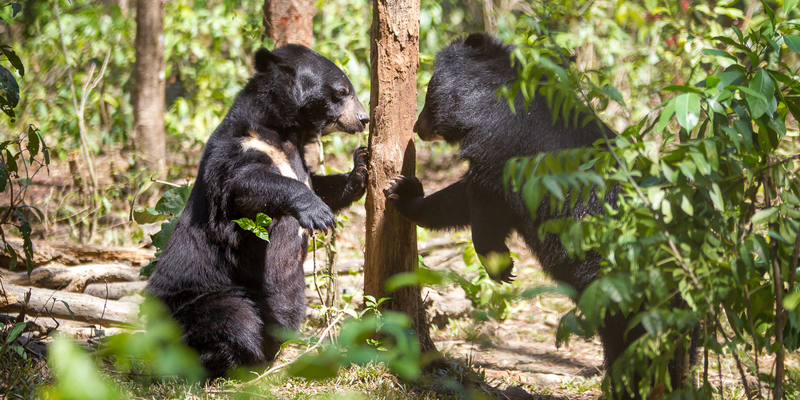 To put an end to this cruel practice, we support our partner organisation Free The Bears (FTB) to build a bear-friendly conservation centre in the Cat Tien National Park. 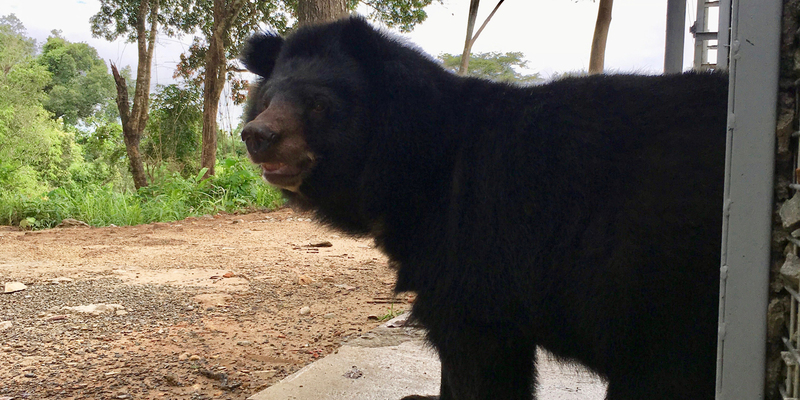 Despite the ban, it is estimated that 1,000 Asian black bears and Sun bears still live a desolate and painful life on the former bear bile farms. Current investigations of our partner organisation show, that as a result of the bear bile ban, the animals are now often sold, killed or left to their fate in the narrow cages, because it is no longer financially profitable to provide them with even the bare necessities. Everyday life of the "Bile Bears"
Trapped in cages that are too narrow, operators extract the bile from the bears under cruel conditions. The permanent physical strain of "extraction” and the poor living conditions lead to physical damage, such as mouth and throat injuries, malnutrition and liver cancer. On top of that, the bears often have chronic behavioural disorders. They bite into their paws and chew on the bars, because they cannot stand the pain and want to escape. One of the few existing housing facilities for the tortured animals was the state-run "Cat Tien Bear Rescue Centre" in the South Vietnamese Cat Tien National Park. Originally built for 16 bears, the number of animals actually living there rose to 36 in a short time. A bear-friendly appropriate accommodation became difficult. Our partner FTB decided to build a completely new and larger facility just a few miles away. By now, 28 animals (Asian black bears and Sun bears) from the public centre have been moved into two newly completed bear houses with adjoining spacious enclosures of the new centre. With the transfer of these bears and freed-up space in the old facility, the remaining bears will stay in their familiar environment for now. In order to rescue other animals from captivity and give them a bear-friendly appropriate life, further bear houses will be built in the new rescue centre. A release of the animals into the wild is not possible as they would not be able to survive there anymore. In order to provide the animals in the new rescue centre with appropriate veterinary care, the next step will be the construction of an animal clinic. So far, only a single treatment room was available. A special feature of the clinic is a glass panel that separates a spacious operating room from a meeting room. 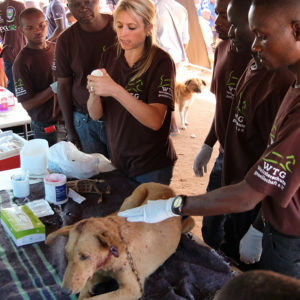 This will enable veterinary students as well as veterinarians to watch the treatments and interact without stressing or endangering the animals. The new buildings will be constructed in a way that offers the bears improved possibilities for recovery and expression of their natural behaviour. 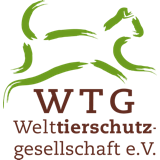 The German behavioural biologist Dr. Marion Schneider observed the animals in the public protection centre last year. 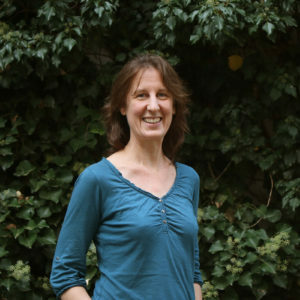 Her observations have been integrated into the planning and construction of the new buildings. After an adaption phase, the effect of the improved, near-natural housing conditions on the behaviour of the animals will be investigated. Subsequently, a behavioural observation will be carried out every six months. Behavioural changes of the bears will be observed and recorded and will provide the centre team with information to improve the conditions for the bears by, for instance, making changes to activity opportunities. Tens of thousands of visitors come annually to the Cat Tien National Park, which is just three hours north of Vietnam's largest city, Ho Chi Minh City. The new rescue centre offers the opportunity to convey the situation of animals and their needs to a large number of people. This will hopefully help to further reduce the demand for bear bile and its products. For the new rescue centre, guided tours are planned twice a day. Visitors can be actively involved in the enrichment programme for the bears, for instance, by giving them toys filled with food for the animals. Additionally, visitors will be sensitised to the cruelty of bear farming and educated about natural bear behaviour. A similar programme is already running in the FTB branch in Cambodia and experiences are shared with the Vietnamese employees.